Van Iperen Mag Zinc Horticultural Grade is a derivate of Magnesium Nitrate and EDTA chelated Zinc fertilizer, which dissolves rapidly and completely. Our product is not sensitive to caking and is recommended as of early spring until fruit setting. 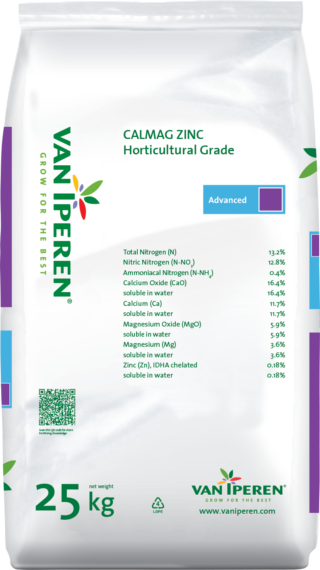 The high level of Magnesium and Zinc improves the production of chlorophyll and the growth of new healthy roots, vigurous shoots and flower buds. 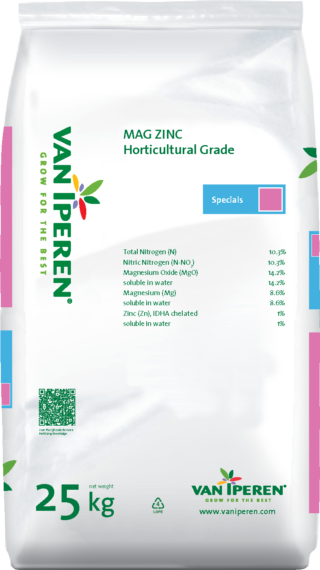 The presence of Nitrogen has a positive effect on the uptake of Magnesium in the plant.